The earth does not belong to us. BCDeskin Jewelry offers a full range of fine jewelry repair services, unique, one-of-a-kind jewelry designs, and quality custom-made jewelry. 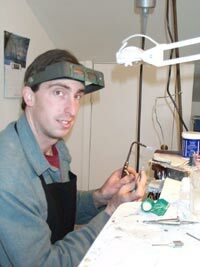 With over twenty two years in the trade and a BFA specializing in metal sculpture, Goldsmith Bill Deskin is proud to offer quality workmanship, speedy service, and competitive pricing. BCDeskin offers full repair service in 14K, 18K, and sterling silver, including tips and prongs, stone setting, chain repair, pendant and earring repair, and ring sizings. Bill also offers jewelry engraving--including inside of rings, on I.D. bracelets, and on many watches. Bill has an eye for detail... a desire to provide exquisite customer service... highly competitive pricing... fast turn-around times... and a full one-year warranty on all work. Most repairs are received, recorded, finished, polished, and shipped within three working days. "I also enjoy getting the opportunity to answer questions from people about their jewelry repair needs. If you have a piece of jewelry in need of repair and you're not sure what to ask for or where to go, drop me an email." Hi Bill. The earrings have arrived. Absolutely outstanding. With our "amateur" eyes we can not tell which is old and which is new. Sure do appreciate your talents." "We use BCDeskin Jewelry & Repair for all our jewelry repair work. He does excellent work and our customers' eyes always light up when we show them their "new" piece of jewelry back from repair. I highly recommend Bill to you." "I appreciate the beautiful work that you did and also how fast you got it done. It was a pleasure working with you." "Hi Bill, the rings came today and look great. You did a nice job on the engraving, thanks. I enjoyed working with you and also enjoyed your professionalism and quick turnaround."